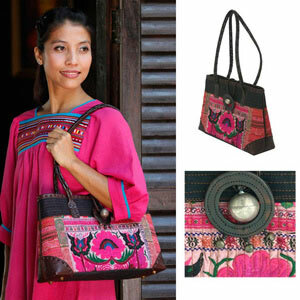 Thailand's hill tribe artistry dresses this versatile shoulder bag with pink hues. 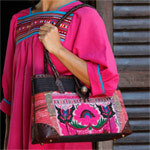 Handcrafted with leather and cotton, the exterior is decorated with florid patterns. It is lined with cotton, and the interior features three practical pockets, one of them to hold a cell phone and another one closing with a zipper to keep small items and coins secure. The bag fastens with a zipper and with a hoop over a ball. The bag stands on brass feet surrounded by leather. Materials: Cotton 85% and leather 15%. Aluminum bead.